We are so excited to join the Junebug wedding netwok. You’ll find an abundance of trusted, seasoned vendors for all wedding-planning needs as well as their What Junebug Loves blog. See our listing on the Seattle florist page, along with some other talented friends and florists. 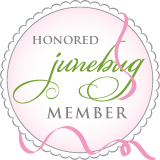 Junebug is a great resource for those interested in planning a flawless, superb wedding.